Sometimes I'm getting some help from a rater unusual angle. 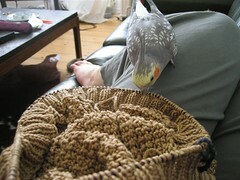 My very reserved but nosy parakeet apparantly likes to help with the knitting! I was absolutely smitten with her at this point and very excited so sorry for the blurry pictures and my "less than average" apperance as this was an instant opportunity!